The Nova Scotia Senior Baseball League is the premier baseball league in Nova Scotia, and has been since its inception in 1977. The league is comprised of 5 teams - the Sydney Sooners, the Truro Bearcats, the Kentville Wildcats, the Halifax Pelham Molson Canadians, and the Dartmouth Moosehead Dry. 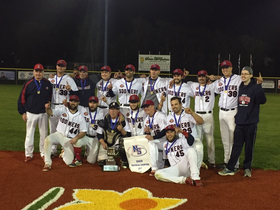 The Sydney Sooners have won their third NSSBL title in the last 5 years with a 3-2 win over Dartmouth in game 6. Sheldon MacDonald picked up his second win and second complete game of the series. The Sydney Sooners rebounded from a 11-1 loss earlier in the day with a 7-2 win in the nightcap to take a 3-2 series lead in the best of seven NSSBL finals. Justin Brewer silenced the hot Dry bats with a complete game win for the Sooners. Jordan Sheppard hit a two run homer to break the game open in the 8th. Game 4 saw the Dry strike early and often and Jason Mosher was solid for the Dry on the hill. Anthony Mckinley, Chris Head and Matt Harding went deep for the Dry. The series shifts back to Sydney Friday night for game 6 starting at 7:00pm. Game 7 if necessary, will be played at 2pm on Saturday. Anthony Mckinley went deep twice and Chris Head once to lead the Dry offence in a 6-2 win over the Sydney Sooners at Beazley Field. Jeff Reeves picked up the win with a solid start before being ejected in the 7th inning. The Sooners lead the best of seven finals 2-1. Game 4 is today at 2pm and Game 5 at 7pm at Beazley Field. Dress warm! The Sydney Sooners shutout the Dry in another pitchers duel to take a 2-0 series lead. Today they needed extra innings to scrape across a run for a 1-0 victory. Game 3 is Friday night in Dartmouth. The Sydney Sooners opened the NSSBL finals with a 4-3 win over the Dartmouth Moosehead Dry. Sheldon MacDonald pitched a complete game for the win. Game 2 goes today at 2pm at Susan MacEachern Memorial Field. The Dartmouth Moosehead Dry won game 5 of the NSSBL semi-finals with a 5-1 win over Halifax. The Dry will attempt to win their 20th league title when they head to Sydney to face the 1st placed Sooners. The schedule should be released today. Catcher: Dan Comeau D. Eleventh in league batting with an average of .331. ( 39 for 118 ).Tied for first in hits with 39.Tied for fourth in runs scored with 21. Third in RBIs with 23. First Base: Devin Mahoney S : third in league batting: .380 average ( 27 for 71 ). Third in runs scored with 23. Tied for second in doubles with 8. Tied for first in home runs with 5. Second Base: Darson Murphy T. Fifth in batting with a .351 average ( 39 for 111 ). Tied for first in base hits with 39. Shortstop:Jeff Chisholm T. Batting average of .278 ( 27 for 97 ). Scored 19 runs and stole 10 bases. Third Base: Anthony McKinley D: runner-up for batting title with a .389 average ( 35 for 90 ).Fifth in hits with 35. Second in runs scored with 24. Second in RBIs with 26.Tied for second in doubles with 8. Tied for first in home runs with 5. Tied for fifth in stolen bases with 13. Designated Hitter; Cory Christie S. Batttng champion with a .420 batting average. ( 34 for 81 ). Tied for sixth in base hits with 34. Fifth in RBIs with 20. Outfielders: Chris Head D. Sixth in batting with a .346 average. ( 37 for 107 ). Third in hits with 37. First in runs scored with 27 and first in stolen bases with 24. Jake Pelham H. Fourth in league batting with a .356 average. ( 36 for 101 ). Fourth in base hits with 36. Tied for fourth in runs scored with 21. Leader in doubles with 9. Fourth in home runs with 4. Jordon Shepherd S. Eighth in batting with a .337 average. Leader in RBIs with 33. Sixth in base hits with 34. Tied for first in home runs with 5. Second in stolen bases with 19. Left-handed pitcher: Devin Mahoney S. 4-0 pitching record. Sixth in Ks with 57. First in ERA with a 0.17 mark. Tenth in innings pitched with a total of 53. Right-handed pitcher: Sheldon MacDonald S: Number one winning percentage with a 5-0 record. Tied for second in wins with 5.Fourth best ERA with a 1.93 mark. Eighth in innings pitched with 56 innings hurled. Gary MacDonald Gold Glove and Gold Bat Memorial Award: John Chapman T. Seventh in league batting with a .337 average. ( 29 for 86 ). Third in stolen bases with 16. On the mound, he posted a 6-3 record and tied for first in wins with 6. Fourth in Ks with 59. Sixth-best ERA with a 2.36 mark. Led the NSSBL in innings pitched with 84. Susan McEachern Memorial Volunteer-of-the-Year Award. ( To be determined ). The Halifax Pelham Canadians outslugged the Dartmouth Moosehead Dry 14-9 in game 4. The best of five series is tied at 2 and forces a deciding game Tuesday 7:30pm at Beazley Field. More details to follow. Losing Battery: Truro, John Chapman (LP), Matt Mingo. Sydney Offence: Cory Christie, 3 singles, RBI; Mike Tobin, 2 singles, 4 Runs Scored, 2 Stolen Bases, Hit By Pitch, Walk; Ken Long, Josh Forrest, Sean Ferguson, 2 singles apiece. Truro Offence: Darson Murphy, Adam Lombard, Shawn Mullins, 2 singles apiece. Sydney sweeps best of five, and awaits the winner of the Dartmouth é Halifax Series. After the bats being shut down in game 2 the Dry picked up another lopsided win in game 3 of the series by a 9-1 score, They now lead the best of 5 semi final series 2-1. Game 4 is Saturday night at Mainland Common, game time 7:30pm. The other series is back in action tonight in Sydney as the Sooners host the Truro Bearcats in game 3 starting at 7pm. The Sooners lead 2-0. Games 4 and 5 will be played Saturday in Sydney if necessary. The Halifax Pelham Molson Canadians received a virtuoso pitching performance from lanky lefty, Brandon MacKinnon, as they nipped the Dartmouth Moosehead Dry 3-2 on a beautiful night for baseball at the Mainland Common. The Pelham Canadians touched Jeff Reeves for a run in the first inning on consecutive singles from Brandon Devlin, Jake and Josh Pelham. Then both pitchers settled in and were dominant until the bottom of the seventh when Halifax pushed across a pair. Steve Murphy singled and was sacrificed to second by Adam Gardner. Pat Gilbert drove Murphy home with a line drive double to the gap in left centre before scoring himself on a ringing double to the gap in right centre by Brandon Devlin. However, the Dry made it interesting in the top of the ninth inning as slugger Anthony McKinley led off with a solo blast over the fence in right centre. Dan Comeau followed with his third single of the evening before scoring on Matt Harding's double to right centre. MacKinnon reached back and fanned Justin Stephens, enticed Robert Gillis to ground back to the mound before getting Matt Doudelet on a ground out to Gilbert at short. The best of five series is now tied at a game each with game 3 slated to take place on Thursday night at Beazley Field beginning at 7:30. Truro Bearcats scored in the bottom of the 1st inning as John Chapman hit a solo homerun to make it 1-0. Sydney tied at 1 with Chris Farrow ,who reached on an error stole second and advanced to 3rd on a ground out scored on a wild pitch 1-1 after 3 innings.highlighted by Jordan Sampson's Sydney exploded for 4 runs on 4 hits in the 4th highlighted by Jordan Sampson single scoring Ianetti who ran for the ejected Mike Tobin) and MacLeod. Truro would get one in the in the bottom of the 4th John Chapman doubled and Jason Smith who batted for Jeff Chsholm who was ejected singled to score Chapman 5-2 after the 4th inning. Sydney put a 4 spot in the 5th. Jordan sampson doubled scoring Shepherd and MacLeod. 9 to 2 after the 5th inning. Sydney put another 4 spot on the board in the sixth 13-2 Sooners. Both teams put nothing across in the 7th. Game ended in the 7th due to the mercy rule. The series shifts to Sydney next Friday night at 7pm. Games 4 and 5 will be played on Saturday if necessary. GAME SUMMARY The home club got off to a good start scoring 2 runs in the bottom of the 1st. Adam Lombard singled. John Chapman was hit by the pitch. Jeff Chisholm walked. Dan Bates doubled to the gap to score Lombard and Chapman. Chisholm was thrown out at the plate 2-0 Bearcats after 1 inning. The Sydney Sooners got on the sticks in the top of the 2nd with 2 out, Sean Ferguson doubled. Johnny MacLeod singled to plate Ferguson. Justin Brewer showed some opposite field power hitting a no doubter over the right field fence. 3 to 2 after 1.5 innings Bottom 2nd Jason Smith first pitch swinging drives deep over the wall in leftfield to tie it at 3. Top of the 3rd Cory Christie singles, Jordan Shepherd doubles. Christie would score on a Phil Brown groundout 4 to 3 after 3 innings of play. Truro's The bottom of the order combined to plate two runs in the bottom of the 4th. # 8 hitter Shawn Mullins singles scoring Dan Bates who reached on an error. #9 hitter Justin Morton sac fly scored Matt Mingo who singled. 5 to 4 Bearcats. Sydney would score 4 runs on 5 hits in the Top of the 8th inning. Josh Forrest singled, Sheperd singled. Phil Brown singled to score Forrest. Mike Tobin squeezed Shepherd home. Sean Ferguson singled to score Brown and Tobin. Both teams were scoreless in the 9th as The Sydney Sooners take Game 1 of NSSBL semi final 8 to 5 to send a huge home Truro crowd dissapointed. The Dartmouth Moosehead Dry scored early and often to complete a suspended game and defeat the Halifax Pelham Molson Canadians 12-1 at Beazley Field. Chris Thibideau and Anthony McKinley homered to lead the charge while Matt Doudelet and Ted Comeau singled twice. Shawn Peverill singled twice while Jake Pelham doubled for Halifax. Jeff Reeves breezed through 5 innings to get the win with help from Justin Davies and Jason Mosher. These two rivals will square off in the playoffs beginning Sunday night at Beazley. The remainder of the schedule will be annnounced shortly. Game Summary:	Sooners Eliminate the Wildcats! Kentville opened the scoring in the 2nd inning as Tyler Fancy singled, Codey Shrider doubled then Brandon MacKay singled in a run. Jason Pleasant-Sampson sac-bunted for 2-0 lead. The Sooners cut the lead to 2-1 in the 4th inning following a lead off error, Cory Christie single, Phil Brown sac-bunt, Mike Tobin walk and Justin Brewer rbi ground out. The Cats loaded the bases up in the bottom of 4th inning as Tyler Fancy, Brandon MacKay and Jason Pleasant-Sampson all singled but did not score as 3 runners were stranded. Pitchers, Alex Ostrov (Kentville) and Sheldon MacDonald (Sydney) then controlled things until the 9th inning when the intensity picked up again. Sydney lead off the top of the 9th with a Cory Christie lead off single, Phil Brown doubled, Justin Brewer tied the game with an rbi ground out for a 2-2 game. Johnny MacLeod doubled down the left field line for the go ahead 3-2 run while Justin Brewer was cut down at the plate. In the bottom of the 9th Codey Shrider leadoff and reached on an infield error, however, eventually picked off at first base on a failed Brandon MacKay bunt attempt to advance him. MacKay ended up striking out, with two outs pinch hitter, Dryden Schofield hit a single but the game ended on a Ted Higa ground out to end the game and season for the Cats. Tough luck losing pitcher, Alex Ostrov gave up 3 of the 4 Sydney hits in the final inning. Meanwhile, the Kentville offence sputtered throughout by hitting into 3 double-plays. The Sydney Sooners clinched 1st place despite losing in Kentville as the Dry fell to Truro. Sydney and Kentville are back at it today. Kentville needs to win both and need Dartmouth to beat Truro on Sunday to force a one game playoff in Truro. Dartmouth and Halifax play Tuesday night to determine second and third place for home field advantage in the first round of the playoffs. Game Summary:	Wildcats Comeback versus the Sooners! Sydney opened the scoring in the 5th inning as Chris Farrow singled, Johnny MacLean walked then Mike Tobin and Jordon Shepherd singled to each drive in a run for a 2-0 lead. In the 6th inning the Sooners padded their lead to 4-0 following a hit by pitch batter, Chris Farrow triple and throwing error on the play to score two. The Wildcats finally got the bats going in the bottom of the 6th collecting singles by Brandon MacKay, Jason Pleasant-Sampson and Tyler Fancy to break up a no-hit effort by Kenny Long but eventually stranded the bases loaded. In the bottom of the 7th the Wildcats again loaded up the bases with singles by Dryden Schofield, John Ansara and Brandon MacKay again. However, this time they scored three runs on an Alex Ostrov rbi single and David McIntyre 2 run single making the game 4-3 for Sydney. Cats pitcher Bradley Fuller kept battling away on the mound despite a high pitch count keeping his team in the game while finally getting some run support. In the 8th inning the Cats faced relief pitcher Logan Aker, Colby Turple doubled, John Ansara scored him on a single to even the game at 4-4. Teddy Higa walked and Jason Pleasant-Sampson blasted a two-out deep ball into the left center field gap scoring two runs on a stand up triple for what would be the game winning run as Cats win 6-4. The regular season concludes on Tuesday as Halifax hosts Dartmouth. The winner gets home field advantage in the best of five semi finals. The Dartmouth Moosehead Dry defeated the Halifax Pelham Canadians 12-0 last night. Dartmouth heads to Truro Friday to take on the Bearcats and the Kentville Wildcats host a three game series with Sydney this weekend starting at 7pm tonight. The Darmouth Moosehead Dry opened the 2017 National Championships with a 11-1 win over NFLD. Jason Mosher had 10 strikeouts in 6 innings. Anthony McKinley and Dave Wallace drove in three runs a piece to lead the offence. In the afternoon the Dry fell to Mississauga(ON2) 3-0. Jeff Reeves pitched a completed game striking out 8, but the Dry could string any hits together. Anthony Mckinley had 2 of the Dry 5 hits. In Game 3 the Dry lost are hard fought game to the eventual Champions BC by a score of 8-6. In Game 4 the Dry needed to win and get some help. They did their part with a 8-2 win over 1st place Alberta, but did not get the help they needed as BC beat NFLD. The Dry ended in a tie with Ontario at 2-2 and Ontario advanced because of the head-to-head victory on Friday. To follow check out baseball.ca or follow @mooseheaddry or @nssbl1977 on twitter. The Dartmouth Moosehead Dry are in Victoria this week representing NS at the Canadian Championships. The Dry start their pool play Thursday morning 9am PST vs NFLD. Followed by a game at 3pm PST vs Mississauga. Check back for scores, but to follow live visit http://baseballcanada.bbstats.pointstreak.com/ or follow @mooseheaddry or @nssbl1977 on twitter. The fog rolled in around the 6th inning forcing the umpires to call the game in the bottom of the 7th as the Halifax Pelham Molson Canadians came from behind to nip the Kentville Wildcats 4-3 at the Mainland Common. Josh Pelham, with a single and 2 RBI, and Steve Murphy with a pair of singles and an RBI paced the Canadians while Jack Berrigan stroked a triple and a single. Pat Gilbert lined two singles and Cam Ritcey chipped in with a double. Colby Turple powered the Wildcats with three singles and 2 RBI. Craig Field earned the win with five solid innings while Brandon MacKinnon got the save with two innings of hitless relief. Bradley Fuller was the hardluck loser. After starting the season 0-12 the Truro Bearcats have gone on a little roll. The Bearcats defeated Sydney 3-1 Friday to win their third straight game, which moves them 1.5 games up on Kentville for the final playoff spot. Jason Smith picked up the win and Dan Bates had two singles and closed out the game on the mound for the save. Kenny Long got tagged with the loss in relief of Devin Mahoney. Phil Brown and Sean Ferguson had two singles each to lead the Sydney offence. The Sooners won game 2 of the series on Saturday by a score of 4-1. No details available at this time. The Bearcats have a 1 GB lead on Kentville for the fourth and final playoff spot and have two games remaining with Dartmouth (Sept 1 and 3rd). Kentville has 4 games remaining Tuesday in Halifax and host Sydney for a three game series on Labour Day weekend. Sydney needs one win to capture the regular season title. In one of the most exciting games of the season, the Halifax Pelham Molson Canadians and the Sydney Sooners hooked up in a seesaw affair that went deep into extra innings before Halifax squeaked out a 7-6 win. Southpaws, Brandon MacKinnon and Devin Mahoney locked horns and delivered fine performances as MacKinnon fired 8 complete with Mahoney throwing 9. Tied at three in the 11th inning, Sydney pushed a pair across only to see Halifax do the same sending it to the 12th. Josh Forrest led off with a single and scored on a single from Jonny MacLeod. Pat Gilbert started the winning rally with a single, was sacrificed to 2nd by Mark Pelham before scoring on a single by Jake Pelham. Josh Pelham singled his brother to second before a Shawn Walsh single loaded the bases. A groundout by Steve Murphy forced Jake at the plate before Josh scored the winning run courtesy of a wild pitch from Reilly O'Rpourke. Craig Field earned the win with 4 innings of relief. Devin Mahoney slugged a pair of homers and doubled helping the Sooners earn a split in the nightcap, 9-3. Mahoney blasted a three-run job in the 4th before adding a two-run smash in the 6th. Chris Farrow and Kenny Long had a pair of singles each to help the cause. Shawn Walsh with three singles, Mark Pelham with a triple and a double, Aaron Ferguson with a double and single led Halifax. Sheldon MacDonald earned the win while Jordan Pelham suffered the loss. Visiting Highlights	Dan Comeau double, single run scored, Anthony McKinley double, single and rbi, Chris Head 2 singles, 2 sb's and run scored, Matt Doudelet 2 singles, rbi and run scored. Game Summary:	Wildcats Walk Off versus the Dry! Dartmouth opened the scoring in the 1st inning as Anthony McKinley doubled to drive in Dan Comeau to lead 1-0. Kentville answered back with 3 runs in the bottom of 1st inning	to lead 3-1. Wildcats played some small balll in the 2nd inning to increase their lead to 4-1. The Dry added a run in the 5th and 6th innings to close the gap to 4-3. In the 9th, Chris Head walked, stole 2nd and 3rd before scoring on the throwing error made by the Kentville catcher during the steal of 3rd base to tie the game at 4-4. During the bottom of the 9th, Ted Higa got hit by a pitch then David McIntyre was walked with one out already completed. The Dry made their way to 2 outs in the bottom of 9th. With Higa at 3rd base and McIntyre at 2nd base the outfielders crept in to catch any soft flares or short liners. John Ansara smashed a game winning hit just over the head of center fielder Chris Head in a soggy outfield to walk off the Cats with a 5-4 win. In other weekend action the Sydney Sooners defeated Kentville 4-3 on Friday night and 11-1 on Saturday. Game Summary: Kentville opened the scoring in the 3rd inning as Ted Higa doubled, Brandon MacKay sac bunted him to 3rd and Jason Pleasant-Sampson hit a sac fly to Center to lead 1-0. The Bearcats responded with 2 runs in the 6th inning, as Adam Lombard walked, John Chapman sac bunted him to 2nd followed by an infield fielding error scoring Lombard. Truro catcher, Matt Mingo then scored Jeff Chisholm on a single to left field to take the lead 2-1. Kentville answered back in the bottom of the 6th inning to tie the game at 2-2. Codey Shrider led off with a double and later scored on a Dryden Schofield single. Truro's Darson Murphy hit a one out double in the 7th with a double followed up by a Lombard single. Truro pitcher, John Chapman then helped his own pitching cause by drilling a sac fly to the gap in left-center field for the eventual game winning run. Truro wins 3-2 over Kentville. Jesse Borden threw a gem while each batter in the Dry lineup had at least one hit as Dartmouth thumped Halifax 11-1 in a game shortened by the mercy rule. Matt Doudelet sparked the offense as he reached base 4 times while knocking in a pair. Chris Head, Dan Comeau and Jake Sanford also had a pair of RBI each. Jake Pelham lined two doubles and a single and was driven home by Josh Pelham to breakup Borden's shutout bid. Halifax busted out to a 3-run lead which was eliminated by the Bearcats in the 6th inning sparked by an RBI double from John Chapman. Canadians left fielder, Steve Murphy led off the bottom of the 10th with a single before Jack Berrigan entered as a pinch runner. A sacrifice and an error set the stage for Pat Gilbert who stroked a solid line drive to left center scoring Berrigan with the winning run. Craig Field earned the win in relief of Jordan Pelham and Brett McGinnis, while Jamie MacLean was the hardluck loser in relief of Jason Smith. Scores from Saturday: Game 1: 3-1 Sooners over Halifax. Winning pitcher Devin Mahoney; losing pitcher Craig Fields. Game 2: 9-4 Sooners over Halifax; winning pitcher Ken Long, Losing pitcher Jordan Pelham. Game 3 Halifax- 9 Sydney- 4 Brett McGinnis win, Jake Pelham hits for the cycle, capped off by his 3rd HR of the weekend ending Sydney's nine game winning streak. The Friday night games were rained out, Sydney was scheduled to host Halifax and Truro was to play Dartmouth. The Sydney Halifax series will begin Saturday with a double header starting at 3pm. Game 3 of the series will go at 1pm on Sunday. The teams are back in action Friday in Truro. The Halifax Pelham Canadians defeated the Kentville Wildcats 5-4 last night at Memorial Park. Visiting Highlights	Brandon Devlin double, and run scored, Jordan Forbes single, rbi and run scored and Jake Pelham double	Home Highlights	Bradley Fuller 8 innings pitched, 9 K's Colby Turple 2 singles and 3 rbi's, Alex Ostrov 2 singles and rbi, Dryden Schofield double and 2 rbi's, Ted Higa 2 singles and 2 runs scored. Game 2 of the three game series goes today at 1pm. Jeff Reeves quieted the Halifax bats while Anthony McKinley and Jake Sanford each slugged two-run homers to power the Dry over the Canadians 12-4. Nicholson records his first pitching win of his young NSSBL career. Joey Cavadini, 2 singles, 2 runs scored and 2 sb's, Tyler Fancy 2 singles, 2 rbi's and 2 runs scored and John Ansara 2 singles and 2 rbi's (game winning 2 run single). The Wildcats added 4 runs in the 3rd assisted by 3 Dartmouth errors to lead 5-2. The Dry added a run in 5th while the Cats responded with two more of their own for a 7-3 score. The Dry scored 5 runs in the 8th inning to take a late lead 8-7. In the bottom of the 9th the Cats walked, stole 2nd, singled and grounded out to place runners at 3rd and 2nd. John Ansara then hit a game winning, 1 out - 2 run single in the bottom of the 9th for the 9-8 walk-off win for the Wildcats. Home Highlights Steve Murpjy: three singles, 3 RBI Josh Pelham: single, RBI Connor Sullivan: single, RBI Adam Gardner: two singles Mark Pelham: two singles Tied at five, Halifax shortstop, Pat Gilbert led off the bottom of the 9th inning by being hit with a pitch from reliever, Jamie MacLean. After an Adam Gardner single and a fielder's choice, he scored the winning run when a ground ball off the bat of Jake Pelham was thrown away giving the Pelham Molson Canadians another walkoff win. Jordan Pelham was impressive and earned the win with 6 strikeouts in relief of Brandon MacKinnon. For the second straight weekend the Sydney Sooners and Kentville Wildcats will be postponed due to rain. No make up date has been set at this time. The Pelham brothers played prominent roles as Josh drove in Jake with the winning run in walk off fashion, while Jordan earned the win in relief of Brandon MacKinnon as the Halifax Pelham Molson Canadians shaded the Kentville Wildcats 6-5 at the Mainland Common. The game between the Truro Bearcats and Halifax Pelham Canadians was rained out. Truro was leading 6-2 when the game was called. No make-up date has been set at this time. With rain in the forecast tonight and tomorrow, the Sooners and Wildcats have decided to moved their 3 game series to next weekend in Kentville. Tonights game between Halifax and Truro has been postponed due to rain. Truro Offence: Justin Morton: 2 singles Darson Murphy, Jeff Chisholm, Dan Bates, Adam Lombard: Each with a single. The Halifax Pelham Canadians defeated Kentville 4-3 last night. Jordan Pelham picked up the win and Brandon Mackinnon shut the door for the save. The Wildcats are back in action tonight when they host the Dartmouth Moosehead Dry, game time 7:30p. The Sydney Sooners swept the three game series in Truro. The Dartmouth Moosehead Dry and Halifax Pelham Canadians were postponed in the bottom of the 4th with Dartmouth leading 6-5. The game will be rescheduled and replayed. The 2017 season kicks off with two games this week as the defending champion Dartmouth Moosehead Dry host Kentville on Thursday. Friday night sees the Dry travel to Truro to take on the Bearcats.